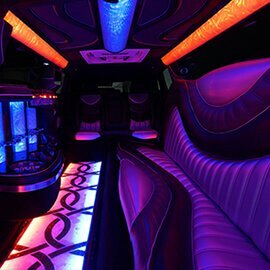 Are you in need of a party bus that can accommodate around 25 passengers? Let us help you out. 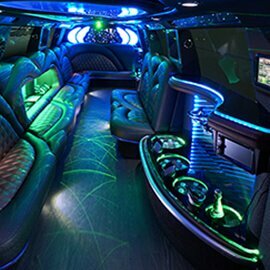 Our company has some of the nicest vehicles in the Metro Detroit area and have the best modern amenities to make sure your party is great. We also have great pricing which is very competitive while also providing service that is always a step or two above our competitors. We are fully insured and licensed by the state of Michigan as a bus carrier and provide chauffeurs who are not only professional but know their way around the metro Detroit area. You won't have to worry about being late, dealing with traffic, nor finding a designated driver for your party's experience. You can even bring the party to the bus itself! 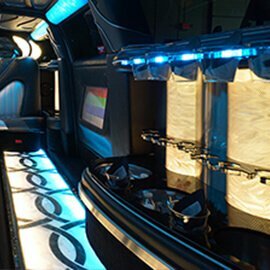 So long as everyone in your group is 21 years or older, you can bring all the liquor you need to keep the party hopping on our party buses. 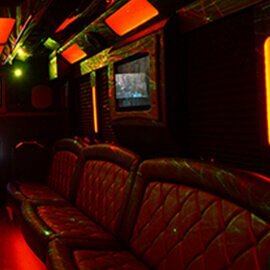 Our 25 passenger party bus is one of our most popular choices. 25 people is a pretty decent party size. It can hold up to 25 passengers but the way Michigan sizes buses is with a 14 inch seat space per person. Not everyone has a 14 inch waist, so in order to sit comfortable, it's best to only have 20-22 passengers. 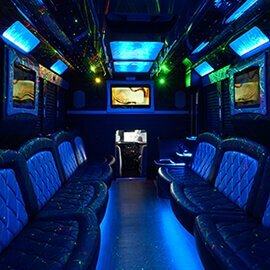 The 25 passenger party bus is full of amenities for you to enjoy while on your run. Leather seats to sit comfortably. Color changing lights and a booming stereo system for a club like feel. Bar tops and coolers filled with ice so you can enjoy chilled drinks. And of course, there is more! 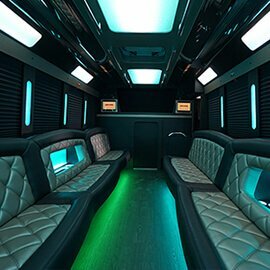 We are always updating our party buses to have the newest, latest, and greatest technologies to ensure that your party doesn't go without. 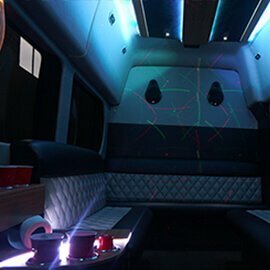 You'll find that we easily combine luxury and top of the line party going equipment on all of our buses. We invite you to take a look at our site. Explore other vehicles we have that might fit the size or style you want. When you want a free quote or would like to set up your reservation, give us a call. Our booking agents are always available to answer any questions you might have. 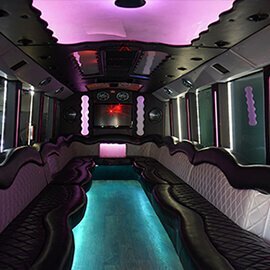 They have been trained to know everything about our business and our party buses and can even help you figure out the vehicle size and amenities that matter most to you and your party. 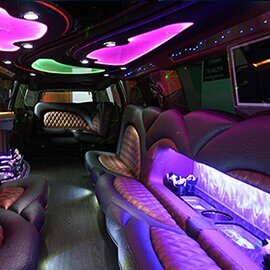 We look forward to helping you set up luxury transportation for your special event! Be sure to contact us at the soonest opportunity, because we take reservations on a first come and first serve basis. Don't wait until the last minute and get left behind, call now! We've been in business for quite some time and have the best vehicles around for the size party that you are looking to throw. It doesn't matter where you're headed or what you plan to do, our vehicles are the most comfortable vessel in which to get there and our professional chauffeurs are the most skilled experts of the road who will get you there safely and on time! We'd love for you to take a look at the vehicles that we have available for you to choose from, so please do navigate using the menu at the top of the page and take a look at our fleet. There are so many different vehicles to choose from of so many different sizes and styles. We think you'll be very impressed. When you're ready to call us for a quote, it's the simplest process in the world. Just pick up the phone, dial our digits, and our experts will welcome you warmly and ask you just a few questions. No personal information is needed from you at all. We'll be able to calculate your price quote based on the date of your event, the city you'll be picked up in and the time, the city your final drop off will be in and the time, and the number of passengers you'll be expecting. That's really all we need to know! So simple and you'll have a price quote in your hands that you can use to comparison price shop or that you can accept right on the spot, locking down your vehicle and date of service with a quick credit card deposit over the phone. The array of events that we serve is so wide and incredible. There's no event under the sun that we will not serve, but a few of our favorite and most frequently requested events include nights out on the town visiting multiple bars and restaurants, bachelor and bachelorette parties where you celebrate your last night being single in style, sports games where tailgating is a much more VIP experience than you ever remembered it to be, and so much more. We also do a lot of teen events like graduation parties, prom nights, and homecomings. We even take care of a lot of sweet sixteen parties. If you've got kids celebrating these big events, this is the best way to ensure that they are safe on the road! Our service area stretches far and wide and you can take a look at our most frequently visited cities right here on our site! In general, we cover Wayne County, Oakland County, Macomb County, Monroe County, Washtenaw County, Livingston County, and Genessee County, but if your destination happens to lie outside of those bounds, let us know and let's see if we can take you there! We always do everything in our power to take our customers wherever they want to go, whenever they want to go there! Looking forward to doing business with you!